I’m Karl Olson, and I’m a software developer, a musician/producer and an animation website moderator/staff writer. If you want to know about my career in software, just check my LinkedIn. Musically, I focus on Nerdcore HipHop, though I also do a lot of Drum n’ Bass, Minimal Techno, Big Beat, Ambient, Trap EDM and Vaporwave. 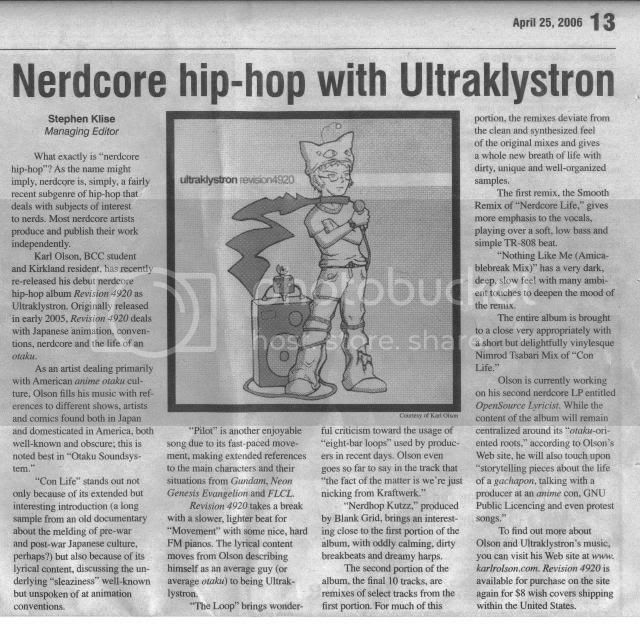 I finished my most recent full-length Nerdcore Rap LP, Ultraklystron in 2018. Meanwhile, I occasionally work as a moderator and staff writer at ToonZone, an animation news and discussion site, as I’m a rather knowledgeable anime and manga fan. I’ve made a lot of good friends through this work, and it’s kept my writing skills sharp. Geek-E Inc. Learns to Love Trap-style Rap production via my album Null Signifier, giving the album a solid 9/10!! The Unheard Nerd really, really enjoys Unwarranted Self Importance. Fandomania also finds Unwarranted Self Importance to be a great album. Hipster Please Finds my album Animatic to be a mixed bag. Exclaim.ca on the other hand reviews Animatic rather positively. Hipster Please briefly reviews Storyboard: The Animatic Mixtape. Jeff Nau on The Jace Hall Show perhaps confuses Hit Points for Hewlett Packard, but otherwise gives me huge props. 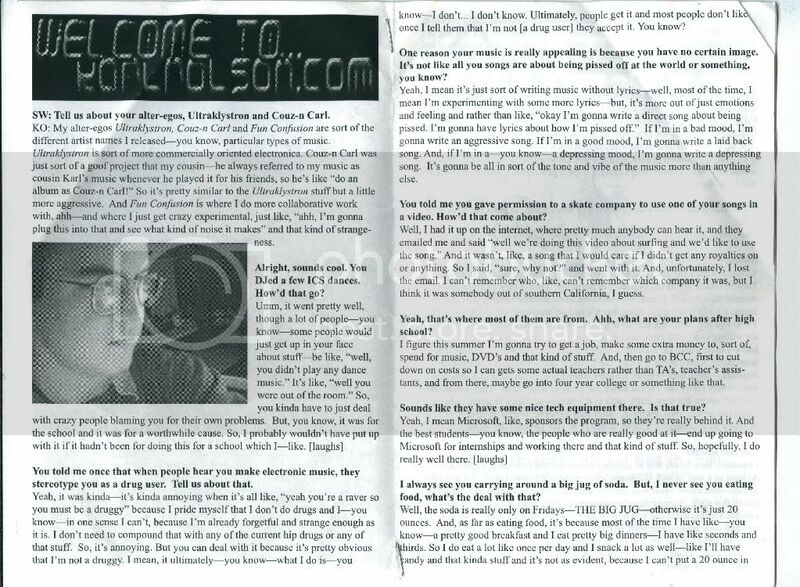 Nerdcore Now interviews me about my upcoming projects. 1-13-07: Geek Entertainment TV talks to Ultraklystron and Nursehella at CES2007. Nerdcore For Life. In fact watch the whole movie on hulu. As far as other notable personal achievements are concerned: I’ve done remixes of mc chris and MC Frontalot songs. 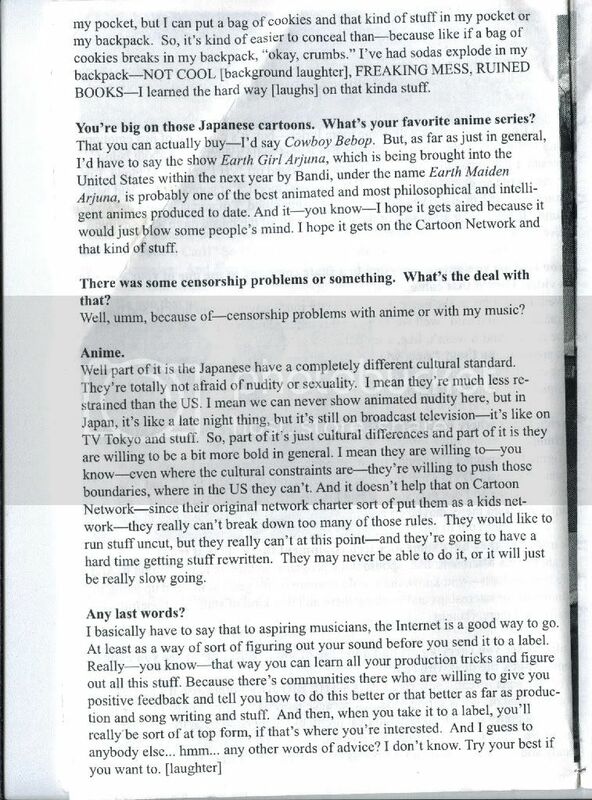 I’ve done a commentary included on the Sealab 2021 Season 3 DVD Boxset. 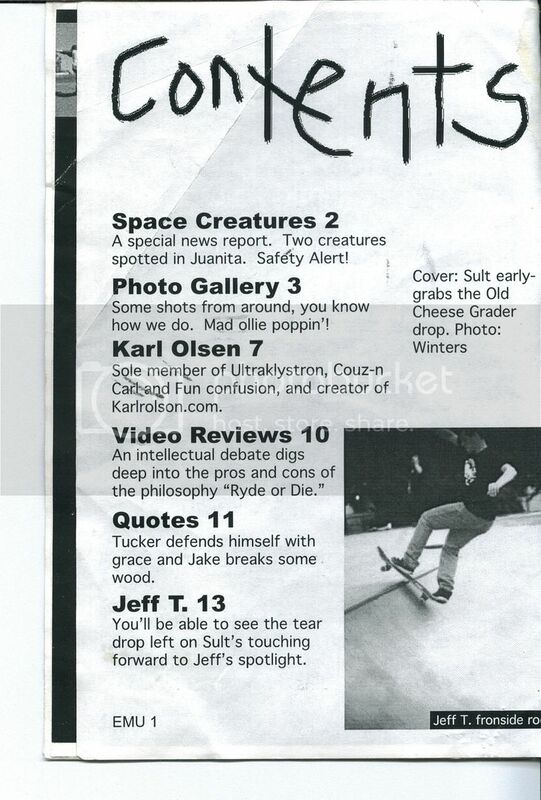 A review of mine is quoted on the back of volume 5 of the single disc release of Spiral. 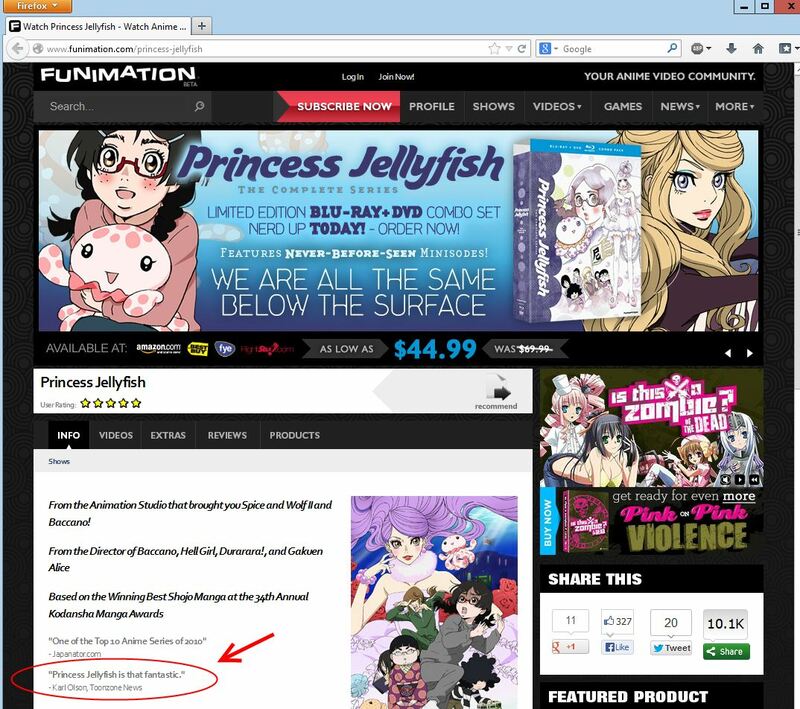 Another review of mine was quoted in on the official US website of Princess Jellyfish after having been used by the US publisher as a means of gauging fan-interest in the title via their Facebook page. I wrote a review of Half-Life 2 for the English-Language edition of Joong-Ang Daily Newspaper. My early Electronica songs had been downloaded over 100,000 times before I graduated high school. I’ve been interviewed by a couple Canadian college radio programs. I was rated as the 10th best Nerdcore artist on a survey at Hipster, Please. I also did a freestyle on SpikeTV’s GameHead after having rapped at Capcom’s Booth at the San Diego Comic Convention. I ended up shooting some video footage that ended up on the PAX2007 DVD which resulted in a special thanks in the credits of one the segments. I’m also in two different documentaries about the Nerdcore scene, and that resulted in being referenced in and my music getting used in an episode of PRI’s To The Best Of Our Knowledge. Fair and Balanced: I’m not notable enough for Wikipedia, and Something Awful thinks I am quite horrible.